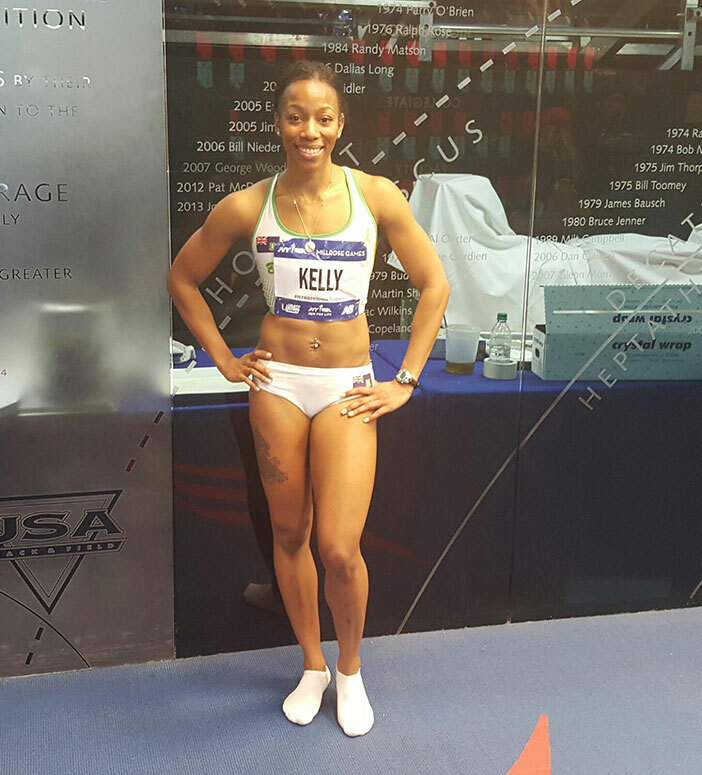 It has been a banner indoor season for Ashley Kelly. Kelly joined Tahesia Harrigan-Scott as the second BVI female sprinter to dip under 7.40 seconds over 60m indoors, when she cut her personal best from 7.46 earlier in the season to 7.39, at the Millrose Games in New York on Saturday. The 400m specialist, coming off a personal best of 53.01 last week and a 23.69 in the 200m three weeks ago, finished eight overall. In North Carolina, returning to her 800m roots, Lakeisha “Mimi” Warner ran 2 minutes 12.85 seconds to place third overall in the UCS Invitational in Winston-Salem on Saturday. Tarika “Tinkerbell” Moses was third in her 400m heat and fourth overall in 55.81 seconds followed by Jonel Lacey in 55.88—her second successive race under 56.00. Beyonce DeFreitas finished second in heat three with the meet’s eight best mark of 57.52. Judine Lacey was second in the fourth heat with a 59.34 seconds time. Karene King was fourth in the 60m dash in 7.50 seconds after advancing by winning her heat in 7.60. Sixth was L’Tisha Fanie with a 7.59 mark after getting to the final with a 7.69 heat winner. King finished second in the 200m after running 24.37 while Fahie recorded a time of 25.58 for ninth overall. Zacharia Frett ran 26.79. Rakeal Jack ran 51.94 seconds for second in his 400m heat, while Josh Hill was second in his section in 52.40. Valique Graham’s 54.55 seconds time was the top mark in heat nine. Bassue clocked 53.18 to finish third in the fourth heat. Central Arizona sophomore Tynelle Gumbs, won the Pima Indoor Classic Weigh Throw with a heave of 19.42m, to follow up on last week’s Jr. College record of 19.70. Her series also included a 19.28 mark. Shaquoy Stephens was second in the Steve Miller Open 60m dash in Manhattan, Kansas, with a personal best of 6.93 seconds. He won his 200m heat in 23.16 to finish eight overall. In Jamaica, St. Jago’s Nelda Huggins won the Central Champs Class I Girls 100m in 11.90 seconds.